Deciding to join a yoga class, especially for the first time, is a big deal! Maybe you’ve been eyeing a local studio, or see people posting yoga-things online and think “if I was only…” but never end up taking the first step – well, don’t feel bad about that, honestly. Beginning yoga can seem intimidating, unwelcoming and overwhelming – but I want to tell you that you are quite able to do yoga, and yes, one that respects YOUR body too. Now, I might be a little bias in that I think my own More to Love Yoga class is a fabulously body-positive one, but I know not everyone reading this might be able to attend mine in Boston – so this guide is for anyone wanting to begin a yoga practice that respects what you’re workin’ with. To keep it simple, I’ve divided it up into three parts: Your mindset, your body, your gear. That said, yoga is SUCH a vast field and it’s impossible to capture it all in a single post – but this is what I’ve learned, being a larger yogi myself for nearly a decade and running a yoga community. If I missed something, email me or pop your addition down in the comments. Get your head in the body-loving yoga game! Let me start with the essentials: yoga is based on an ancient discipline inspired and connected with Hinduism, emerging thousands of years ago from what is now modern day India. Back then, wise people wanted a way to cultivate and prepare their bodies and minds to devote themselves to the spiritual callings in life. There are primary texts and passages taught through the ages that have shaped and informed the lineage of yoga and its philosophies which are built upon a code of morals, ethics, and behaviors about how to lead a good life. The yoga WE think of here in the West is actually just a sliver of the full spectrum and practice of yoga. Yoga poses – called asana in the original Sanskrit language – is the various positions the human body can take, each one believing to develop the body, mind, and breath to prepare someone for deeper meditation. In the Western modern practice of yoga, there is more focus on the physical aspects of yoga which have many benefits, including stress reduction, increase mobility and flexibility, better concentration, just to name a few. WHEW ok, the history of yoga is DEEP, FASCINATING and I believe anyone who is curious about yoga must respectfully learn where it originates. But let me help you with one really big question: “Can my body even DO yoga?” Here’s something that should come as a relief: anytime your mind ventures into “WHAT IF” land, you’re in a perfect spot to start yoga. Why? Because yoga is about checking in with yourself – your mind, body, thoughts – and through being more self-aware and catching these concerns, you build self-confidence. I give the analogy that yoga is like learning a new language and it’s impossible to jump right on in, knowing everything. That’s why so many yoga teachers say that the BEST mind for yoga is “beginner’s mind” because you’ll always be humbled by the experience. I’ve been practicing yoga for nearly a decade and I still feel like a beginner. YES your body, just as it is right this very moment, can do yoga. *nod* You are allowed to take the pace and postures that feel good to you. And no matter your age, size, flexibility level, health-matters – there is SOME type of yoga that you can enjoy. Intimidation is very real, especially when people on the outside look at yoga and think “I look nothing like that!” but this perception is changing as more and more people of all shapes, sizes, colors, backgrounds, and ability are doing yoga. Truth-time: EVERYONE who does yoga today started out feeling like an outsider – even me – and I think it’s a normal step for anyone trying something new to feel scared. So don’t let the temporary feeling of the odd-person out stop you from a very rewarding experience. Awesome, so you’re moving forward with trying out yoga – yay! So now comes some other important question, like….what KIND of yoga to start with? Where do I go? What about very real issues I have in my body? Again, everything you ask is valuable to help you find a space that is most appropriate for you. Yoga is a wide range of style now – and when you look at it, it’s easy to get overwhelmed with the varieties. Most yoga studios do a good job at describing their classes, but sometimes, it can still feel confusing. Gentle = Level I = Hatha = Great for beginners and/or those looking for a slower yoga class that focuses on the foundations and essentials. This is also More to Love Yoga Level I. Flow = Level II (usually) = Vinyasa = you’re going to sweat a bit because the poses all link together and often, include more advanced poses and a quicker pace. This is More to Love Yoga Level I/II. Power = Level II/III = Bikram/Ashtanga/Iyengar/Bapsite = Vinyasa-style and more advanced where lineages of yoga-styles become more focused. Sometimes the rooms are heated (85 – 100 degrees) and typically, people in these classes have been practicing for a while. I don’t recommend this for beginners. Another [shameless] pitch! More to Love Yoga is devoted to making yoga feel comfortable for you, whatever size. In my class, I have people of all shapes and ages, health and limitation concerns – and every student that walks into my class for the first time talks with me about what’s going on for them. Some people sit in a chair, some take breaks when needs, other modify to what feels good – and often, people challenge themselves to move in a way they didn’t’ think was possible. During my class, I make sure to offer plenty of variations on poses so that everyone feels comfortable and confident in what they’re working with today. The best way to find a studio and teacher that is right for you is to ask your friends and do a little search online. Get a feel for teachers by their profiles and what slant they approach life with. And never EVER be afraid to email/call the studio in advance and talk with someone – this will give a good vibe as to what the place is all about. Talk to your teacher before class, let them know you’re new and what you’re interested in working on. If they are worth their certification, that’ll gladly offer support and help to make you feel comfortable and safe in their class. And if they don’t make you feel welcome, let the studio know – no one should ever leave a yoga class feeling bad, never ever. Also, sometimes in class the teacher will use the traditional Sanskrit names for yoga poses which might leave you feeling confused even more. Don’t worry – just look around, see what other people are doing – over time, you’ll learn to recognize the names and will even feel proud of it! For prices, studios range depending on where you live, but there is often a class-pass option which makes things most affordable. More to Love Yoga offers a few types of class passes and they never expire. Ok, now for the FUN part – all the gear! But let me tell you something important: yoga is NOT a fashion contest, even though there are plenty of companies that try to make it feel that way. Yoga supplies are fairly straightforward: something comfortable to move in + a mat and a block or two. Let’s talk about clothing first: BE COMFORTABLE. Nothing worse than pulling up or down an item of clothing during a class – it’ll take your mind off your practice and just isn’t necessary. And you don’t have to spend a fortune either – a simple workout shirt and some yoga pants will do you well. Personally, I like the plus size lines from Old Navy, Target, and Kohls for gear. But there is also a whole universe of yoga leggings that are fun and creative and two of my favorites are Lineage and Personal Record – both make More to Love sizes! Now the most important thing: your yoga mat. Prices for a mat can range between $15 – $100 and like anything, you get what you pay for. Try to avoid mats that are too thick – it seems like they’d be good, but it’s actually harder to balance, so stick to a mat that is 3/16′ thick and you’ll be golden. 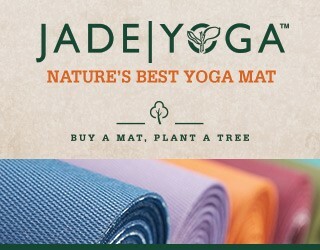 My personal favorite is Jade Mats which comes in many styles – including extra wide! – and while it’s one of pricier ones, it’s still in great condition after many, many, many classes. Also, try to touch your mat – not buy online – because mats are a personal item and like the wands in Harry Potter, I believe that the yoga mat…chooses you. The touch, feel, texture of a mat depends upon what you like so explore a few before you seal the deal. And clean your mat once in awhile with a simple damp cloth – remember, your hands and feet are on it! As far as additional supplies like blocks, blankets, straps – your studio will usually supply these for you. If you’re setting up a home practice, the website Yoga Accessories has great offers on supplies. It’s also nice to have a small hand-towel so that you can wipe hands or use as an eye-mask during relaxation. Oh, and a water-bottle – always hydrate! Yoga is for anyone, anything, that breathes and the way you practice this life-long discipline is truly within your own power to enjoy and develop. Yoga is more than a physical practice, it’s a process to be more in-tune with yourself and finding a community and space that lets you feel more connected is vital. The biggest pearl of wisdom I tell my own yoga students is this: you are allowed to feel good in your body, and yoga, can help you do that – on and off the mat. Like my post? Comment below & please share it!